Hydration the way you want it – Naturally refreshing and delicious! With the right amount of hydration, it's easier for your body to do just about everything. Fresh, pure water is a natural source of energy, beauty, and total body health. The list of water's benefits is endless, but just as important as the hydration your body needs is the hydration source you choose. "Plain" water may seem boring to drink. Soft drinks and processed fruit juices are loaded with added sugars. So-called "sports drinks" contain preservatives and artificial colors. Coffee and tea contain caffeine which actually leaches water from your body! There's a better way to stay hydrated... and it's called COCOZIA. COCOZIA is natural hydration from Mother Nature herself. Unlike commercially produced drinks, COCOZIA is fat-free and contains no processed ingredients of any kind. It's 100% organic and it's so good for you! 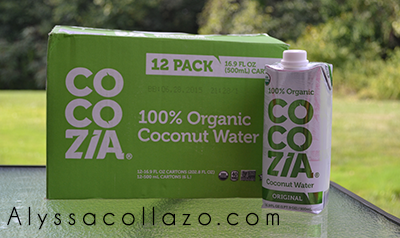 COCOZIA contains fresh, pure water from inside a young green coconut. It’s a clear, naturally sweet liquid that has just 70 calories Make COCOZIA your go-to answer when you want easy-to-drink hydration, coupled with a natural abundance of potassium and magnesium, as well as other electrolytes. You’ll go nuts for the great taste of Cocozia Coconut Water! This is my second time trying COCOZIA, this time in a different size. My family loves COCOZIA and I love that like Gatorade, coconut water contains an abundance of electrolytes, such as potassium and magnesium, which greatly help with hydration. My girls are always on the go and with Cocozia they are always hydrated! Cocozia comes in two different sizes 11.1 - ounce and 16.9 ounce (both in packs of 12), You can also try Cocozia in Chocolate, Coffee, Mango, and Pineapple. I highly recommend you giving Cocozia a try, I promise you will LOVE this brand! After reading this, I definitely want to try this. Other than fresh from a coconut, I don't think I've ever tried coconut water from the store. I wonder if it is the same? I've heard a lot of good things about coconut water. It's very good for you. I've never tried it, but I think I should! I love coconut water. I have never heard of that brand before. I will be on the look out for it. I love their water. They sent me a sample box awhile ago, and I thought it was great. And, it's perfect for after a hard workout. I am so glad that you shared this information. I have seen this product, but never tried it. I love coconut water. I have not tried this brand though. Nice to see a 12 pack with it, sure helps on the cost! This looks interesting. I am not a huge fan of coconut water, because it is usually room temp. Perhaps this is worth a try. I've tried coconut water a few times, but I am just not a fan. I don't know what it is, but I just can't do it! I really wish I liked the taste of coconut so I could try this. It sounds so refreshing! I have never tried coconut water before! I really should. I've heard so much about Coconut Water - it seems like everyone is drinking it for its health benefits. my oldest daughter is in love with coconut water, i'm going to have to get this for her.